Bajra or Sajjalu or Kambu or Pearl Millet are another variety in millet's class. They are also very good for health. They are good for heart health, bone growth and also help in reducing cholesterol levels and help in keeping diabetes under control. Of course they take longer time to digest so preferably suggested to take only in winter. As we prefer to take very light and easily digestible diet during summer. But I get them very rarely in the stores, so I cook them whenever I get them irrespective of season. Today I made dosa with them. A very simple and easy dish. Soak bajra, rice, black gram and fenugreek seeds for 3 to 4 hours. Blend them in a blender jar to a smooth and fine batter. Add salt. Allow this batter to ferment for 6 to 7 hours. Heat non-stick dosa tawa or iron skillet, for checking whether the tawa is hot enough or not, sprinkle some water on it. If water sizzles immediately then the tawa is hot enough to make dosas. Pour a ladle full of batter on hot tawa and spread it in circularly. Pour a spoonful of oil on dosa. Cook it for 2 minutes and flip it and again cook for another 2 minutes. 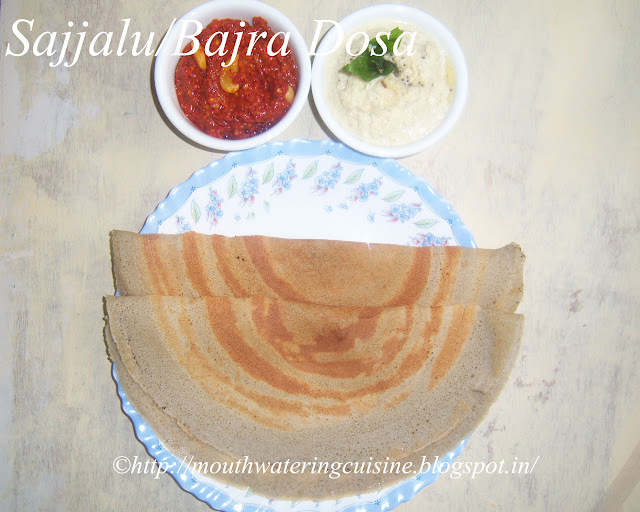 Serve bajra dosa with coconut chutney or any other spicy chutney. For more breakfast recipes click here.Thank you for visiting my blog. Hope you liked all my recipes. Any feedback and comments are appreciated.